I've been working on May's kits this week and they have been dispatched today so if you are a subscriber they should be landing on your doormat within a few days! 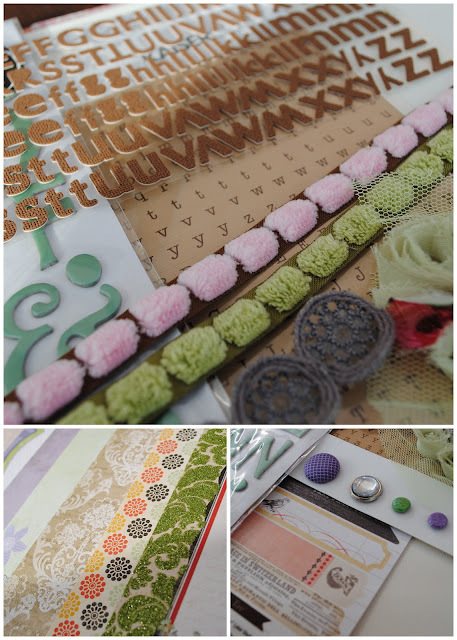 We have some very lush papers by My Mind's Eye, Kaisercraft and Prima as well as a whole variety of embellishments, trims and alphabets. As there are 5 Wednesday's in May - you get 5 page kits in this month's kit so it is even better value than normal! The page kits will be available to buy individually but if you want all of them delivered together every month for a lower cost with postage included you can subscribe here - just £25 per month!